So, you're hosting the Super Bowl party this year and are looking for the best way to keep your guests entertained? You've come to the right place! Below is a list of games/office pools you can use during your party! 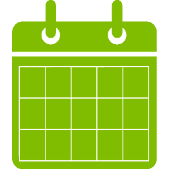 We also have a list of Tips for Hosting your Super Bowl Party! Before we get to the games, let's talk food! Food is usually the main attraction at your Super Bowl Party, so we have created a full list of Super Bowl Recipes, which include Buffalo Chicken Dip, Teriyaki Meat Balls, Hot Crab dip, and much more! The most popular is the Super Bowl Square grid office pool. 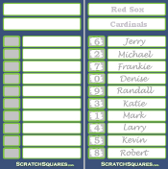 This is typically a 10 x 10 grid, where numbers are randomly drawn to represent the score of the game. 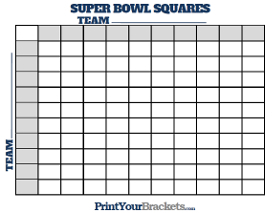 Here are some small printable Super Bowl Squares and our Large Super Bowl Square Grid which is 24" x 32". We also have some unique Super Bowl Square Scratch-Off Cards! We have compiled a list of 30 crazy super bowl questions. Who will get the first penalty? Will there be a touchdown of more than 40 yards? Who will be the MVP? Simply visit the Super Bowl Prop Pool page and print enough copies to pass out to all of your guests. Have each one of them fill in their answers to the 30 questions. After the game, whoever has the most questions right wins! A variation of the normal 100 Square Grid, our 10 Line Super Bowl Squares work great for a small number of people. There are 10 lines/squares, each participant is randomly assigned a number from 0-9. 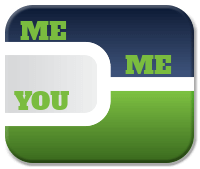 Simply add the two team's scores together at the end of each quarter and use final digit to determine the winners. Another variation of the normal 100 Square Grid, our Super Bowl 25 Square Grid has space for 2 participants. Each square has 2 winning numbers for the AFC team and two winning numbers for the NFC team. We also have the Large 25 Square Grid available in our store on 24" x 32" prints. The final variation to the normal 100 Square Grid is our Super Bowl 50 Square Grid. The 50 squares are perfect for a medium size super bowl party. Each square has two possible winning numbers for the NFC team and one possible winning number for the AFC team. This Large 50 Square Grid is also available in our store on 24" x 32" prints. Try our Super Bowl Bingo game, where we have compiled 10 different bingo cards that relate to events that can happen during the big game. The first person to get a Bingo wins! We have created a Super Bowl Bingo Card Generator tool, where you can create custom unlimited random Super Bowl Bingo Cards! The generator also allows you to add text to the card and change the colors! We have created a Super Bowl Trivia Game with 15 questions that go all the way back to Super Bowl 1 through now! Pass this out to all of your guests, the person with the most correctly answered questions wins! We have created a unique Super Bowl Sudoku game, where instead of using the numbers 1 through 9, we have used images related to the Super Bowl. The first person to correct solve the puzzle wins! Here is a fun little Kid's Super Bowl Party Game to keep the kids entertained at your next party. The game is a brain teaser where the kids try to re-create a field goal post by rearranging the crayons, but they are only allowed to move 2 of the crayons. We have created a unique Super Bowl Word Search Puzzle, where the guests try to find the word "bowl" 3 times. It's harder than you think! Have your guests try to correctly guess the total points that will be scored in the game in our Guess the Score party game. Have your guests try to unscramble 20 words related to the Super Bowl in our Super Bowl Word Scramble. The first person to unscramble all of the words wins. Pass the cup is an oldie, but goodie! It goes like this, start off by giving the cup to one person who will drop a dollar in the cup and then say a word like "Field Goal" for every single play that is not a field goal the cup gets passed to the next person and that person puts a dollar in. The person holding the cup when the field goal is made gets to keep all of the money that was in the cup. That person puts a dollar back in the cup and comes up with the next word. Examples for words are Touchdown, First Down, Interception, Fumble, Time Out ect..
Then each person that chose that team has to take a drink(shot, cup of beer?) You make the rules. You can also come up with your own scenarios, the above scenarios are just examples. Here is a list of some different Super Bowl Drinking Games you can play at your next party.